Editor’s Note: I’m pleased to welcome Brenna Ciummo from Seattle Coffee Gear for a guest post on LeafJoy today. Ah, the enigmatic flowering or “blooming” tea. While the tea has become popular in recent years, the information surrounding its creation and inception is somewhat nebulous. As with many teas, experts in the field seem to have varying opinions on how the tea is best processed, brewed and enjoyed. Likewise, there’s a healthy debate over whether the tea has been around since ancient China or if it’s an invention of the 1980s. One thing is for certain; the tea sure is pretty when it blooms. 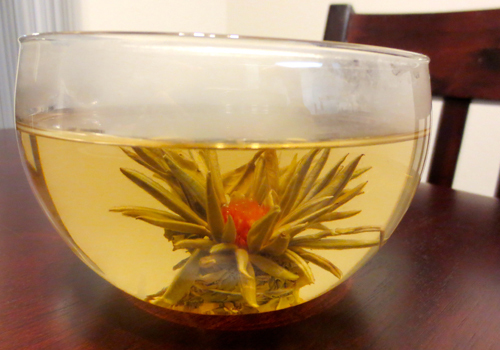 Making flowering tea is more of an art form than simply gathering tea together. The process begins with collecting the delicate buds of the camellia sinensis plant. Generally these buds are harvested in the Anhui, Fujian and Yunnan proveniences of China. The buds are then processed into green, white or even black tea. Green and white flowering teas are more common; especially since white tea varietals like Silver Needle have long buds that are good for wrapping around the flowers found inside blooming teas. Selecting the flowers for blooming tea is just as crucial as harvesting the tea leaves. The flowers must be picked at just the right time to make sure they are good quality and will hold up during the tea making process. After they are picked, the flowers are dried and dehydrated to ensure that the integrity of the bloom is preserved. According to tea consultant Lindsey Goodwin, most blooming teas contain one or more flowers, the most common being globe amaranth, yellow chrysanthemum, jasmine lilies, hibiscus, marigold, carnation or rose. However there are some teas that don’t contain any flowers but are still considered to be “flowering” because of the way the leaves open up when they are immersed in water. Once the tea leaves and flowers have been processed, the best looking ones are selected to make a blooming tea “ball.” The tea leaves are measured to make sure that they all are the same length so that they will make one neat bundle when sewn together. 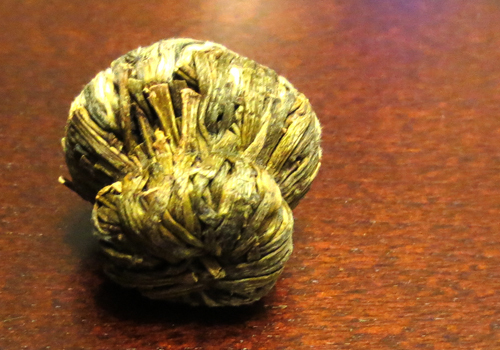 A bunch of tea leaves are then tied together, creating the bottom of the blooming tea ball. Next, a flower is placed in the middle of the bundle of tea, more tea leaves are sewn around the outside (covering the majority of the flower) and the top of the ball is sewn shut. The tea can come in a variety of shapes, such as a globe, peach, rosette, mushroom or a heart. The shape of the tea is determined by the way the ball is sewn, and oftentimes the tea leaves are slightly moistened to make it to easier to achieve the desired shape. Once the tea has been sewn together, it is left to dry. In addition, some varieties of the tea are also scented with jasmine flowers or flavored with artificial sweeteners to provide a stronger taste. The beautiful blooms make the tea a great choice to serve at tea parties, since they are likely to impress guests. The tea also has a mild flavor, it’s generally described has having a light floral, vegetal or even fruit taste, which appeases many palates. Brenna Ciummo is a writer for Seattle Coffee Gear and enjoys sharing her knowledge of all things coffee and tea.